Can I buy contact lenses without a prescription online? At Feel Good Contacts, you can order your contact lenses online without having to show us your prescription. We trust that you have an up-to-date copy and know what you need, so we make ordering your contact lenses quick and easy, with no added stress. How do I buy contact lenses if I don’t have my prescription? If you haven’t been given your contact lens prescription from your eye care practitioner, it’s important to note it is your legal right to request a copy for yourself. There’s also no need to worry if you’ve misplaced your prescription since your last ordered your contacts. 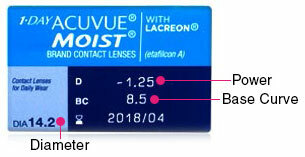 You should be able to find your prescription details on the packaging of your most recent box of lenses, as shown below. If you’re having trouble understanding your prescription, read our helpful guide on how to read your prescription. Otherwise, feel free to get in touch and we’ll be happy to assist. You can call our dedicated and friendly customer service team on 01 514 3614 or send us an email at cs@feelgoodcontacts.ie. Can I buy my optician’s contact lenses online at FeelGoodContacts.ie? High street opticians are known for repackaging contact lenses in their own branding and selling them for more. At FeelGoodContacts.ie, we sell the same branded contact lenses for up to 50% cheaper than the high street and guaranteed cheapest price in Ireland with our Price Match promise. .
Specsavers easyvision contact lenses, Boots contact lenses and other contact lenses from High street opticians can be found for a cheaper price at FeelGoodConatcts.ie in their original manufacturer packaging. Browse our range of contacts to track down your equivalent contact lenses.